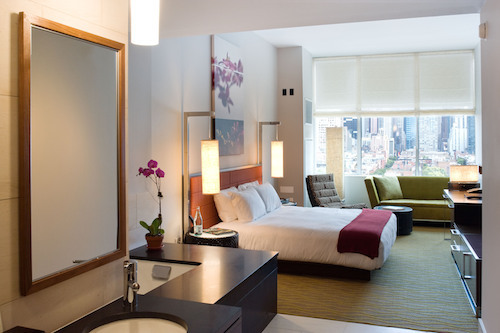 A trip to New York City is an iconic vacation for many, and where you stay can make a big difference in the experience you have in the city. New York can be chaotic, confusing and stressful, especially if you stay in the touristy area of Midtown. I used to make that mistake every time I came to the city and consequently never loved New York. All that changed when I started staying in the many neighborhoods of New York. It was my most recent trip, staying at Ink 48 in Hell’s Kitchen, where I finally fell in love with The Big Apple. Hell’s Kitchen was the inspiration for West Side Story and is now home to many broadcast and music recording studios, including the Daily Show. The kitchy Kimpton hotel is just a stone’s throw away from Midtown and the Theater District, but feels like an entirely different world. Unlike the big conference hotels in Midtown, Ink 48 has personality. As a journalist, I appreciate that it is housed in a 1930s printing press building. The history is felt in the hotel’s Press lounge, one of Manhattan’s best rooftop bars, and the farm-to-table Print restaurant. The different floors are named for different fonts; Times Roman, here I come! My CityView Studio King Room, at 435 square feet, is bigger than some of my friends’ city apartments. The centerpiece of the room is a deep soaking tub, which I enjoy later in the evening while looking at the lights of the city. In addition to the tub and the view, the most standout feature was the fact that the room was quiet at night — something hard to find in a NYC hotel. If you really want an over-the-top experience, book the Heaven over Hell Penthouse Suite featuring over 1,100 sq. ft of living space and a 2,200 sq. ft. rooftop terrace to enjoy the views. Arriving late in the afternoon, I avail myself of the Kimpton’s complimentary Happy Hour in the lounge. Here I chat with the host Anthony and learn about Viv, a nearby Thai restaurant that sounds like a perfect place for a pre-theater meal. As I walk to the restaurant, I’m struck by what a community this area really is. I pass two neighborhood parks filled with families enjoying the good weather after a hellish winter. Viv is all Anthony promised it would be and more. The place is packed despite it being early on a Sunday. I think it’s because they have $5 drinks for Happy Hour. Five-dollar drinks in Manhattan? This really is a find! The tom yum soup I have to start is a spicy mix of vegetables and shrimp and Pad See-Eiw noodles with chicken and shrimp in a light brown sauce; it hits the spot after missing lunch while traveling. After being in Chicago, I’m struck by how silent it the city is as I walk back to Ink 48. No cars are honking, no voices are yelling, no dogs are barking. It’s as quiet as Phoenix would be at 9:30 at night. I’ve never experienced this in New York anywhere at any time of day. The next morning it’s time to pre-work off a meal I have planned later on at the James Beard House with the hotel’s Runner’s Amenity Kit. The Hudson River path along the Westside Highway is just steps from the hotel. 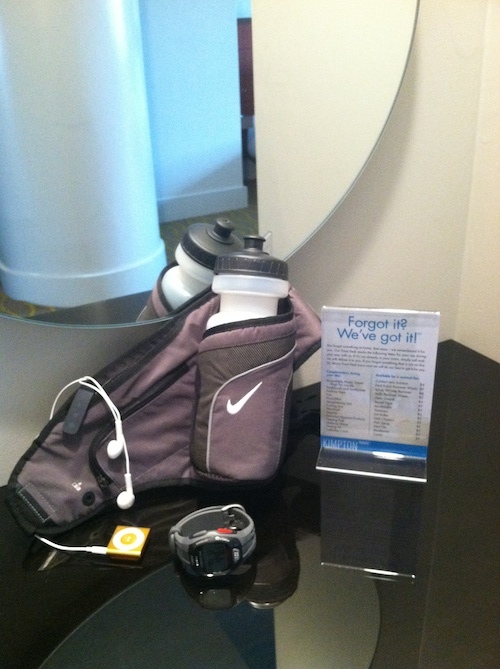 The kit includes a running path map, a pre-loaded iPod Shuffle, a sports watch, a running belt to hold water and an energy bar and sports drink upon return. I admit, I’m not really a runner, but I walked at a fast pace! With a workout in, I’m ready for lunch at the iconic James Beard House. 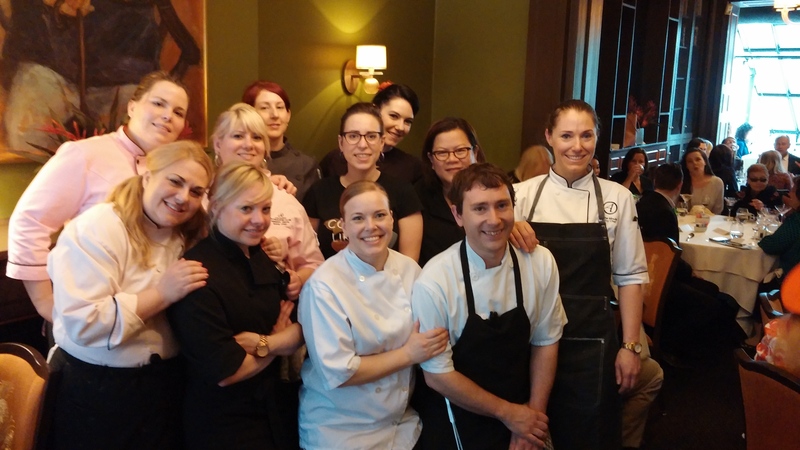 The lunch is hosted by Wines of British Columbia and features a team of all-female (girl power!) Canadian chefs. As a foodie, I know this meal will be a highlight of my trip. The house is quite literally a row house on 12th Street. The most surprising thing is just how tiny is the kitchen that produces gastronomic masterpieces. There are lunches and dinners offered at the house year-round that the general public can attend. Alas, I have meetings during the afternoon, but if you have a free day in the city, I would recommend visiting the Metropolitan Museum of Art, one of my favorite art museums in the world. Simply wander the expansive museum and soak it in. With so many styles and periods, there is something for everyone. Another suggestion would be to pay homage at the 9/11 Memorial that opened nearly one year ago. Timed tickets purchased online are the way to avoid the long lines. New York is truly a perfect city for the art lover, theater lover, shopaholic, foodie, socialite and more. Whatever you’re into, the city has something to entice. Despite it being filled with so many things I love, my love affair with New York wasn’t love at first sight, but rather a long courtship that started with dislike and slowly over time simmered to like and now has blossomed into full-blown love.